Nested Layer Manager 2 provides the ability to nest layers in 3ds Max. This script is small, fast and allows layers to be nested in an unlimited number of folders. It has complete 2 way communication with the default layer manager; If anything is altered in either, both layer managers are updated. 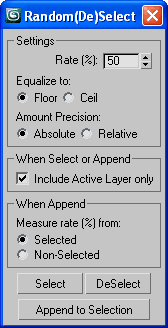 This allows people without this script installed to still see the normal layer organisation present in the file. 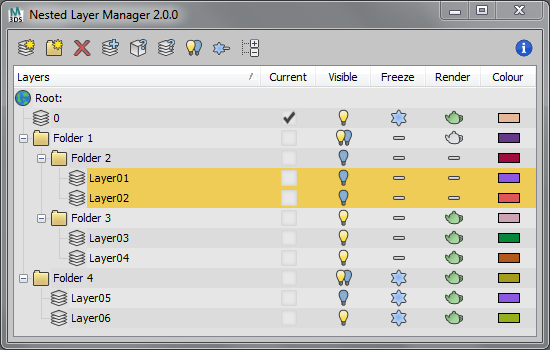 Nested Layer Manager has a free 30 day trial. Simply create a layer and name it specific to what should go into the layer, for example "CHAR" for character geometry. Any character geometry you make you just need to remember to include "CHAR" in the object's name and when the Quick Layer Organizer is run it will find any objects with "CHAR" in the name and put them into the "CHAR" layer. Any objects that don't match the name a layer will remain in whatever layer they are currently in and the default layer is ignored during the organization.